This results-oriented book teaches you that wanting a relationship is nothing to be ashamed of, that staying in a dead-end relationship will keep you from finding a thriving one, that there are simple and effective ways to increase the odds of meeting the right kind of people, and that you are a good catch and you should not hide it. Set out in easy-to-follow steps, this text includes hints, goal-setting instructions, anecdotes and motivational thoughts how to make an end to your relationship problems. Each chapter includes an action plan--actual assignments for the reader to complete as part of the process of gaining confidence, improving self-esteem and increasing dating opportunities. Readers are asked to apply the same principles to finding a mate that have gotten them ahead in business: planning, perseverance, effort, and time. How Not to Stay Single presents a unique plan of action for finding that elusive, emotionally fulfilling attachment. It shows you how to stop waiting for a relationship and how to start making it happen. Unlike other relationship books, this book is about changing what you are doing, not about changing you. 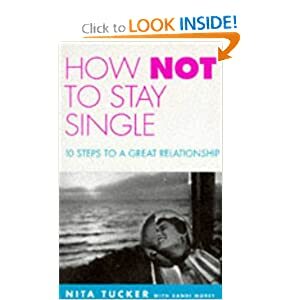 Nita Tucker has been presenting her popular 1-evening seminars to sold-out audiences in cities across the United States. Tucker has appeared on national talk shows such as Oprah!, Sally Jessy Raphael, and Sonya Live, and now How Not to Stay Single will finally bring to its widest audience yet her amazingly successful formula for finding a successful, romantic relationship. Come out of the closet. Wanting a relationship is nothing to be ashamed of. Stop wishing and hoping. Do not leave something this important to chance. Set yourself free. Staying in a dead-end relationship wil keep you from finding a real 1. Be a great catch. When you are turned on about yourself, other people will be turned on to you. Get out there and date. Dating is a numbers game - get the odds on your side. Just say yes. Stop letting the good 1s get away. Get used to rejection. It is going to be a bumpy ride. Just say no. Se x can end a relationship before its starts. Adjust your attitude. The person who keeps screwing up your relationships is you. Do not blow it. You can not force commitment but you can help it along. Afterword. How not to fail.